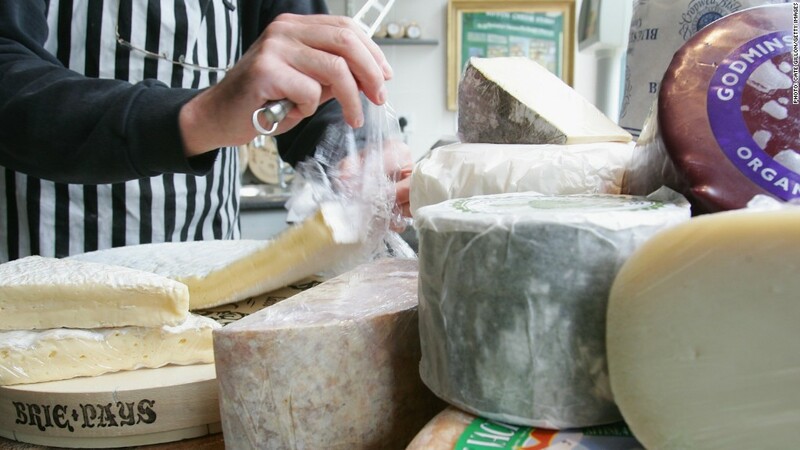 Cheese, fruit and pig meat are Europe's biggest food exports to Russia. Russia's ban on food imports will push prices up at home and cost Europe billions in lost exports. Moscow retaliated against Western sanctions by banning imports of fruit, vegetables, meat, fish, milk and dairy products from the U.S., Europe, Australia and Canada. The U.S. and Europe imposed sanctions on Russia over the Ukraine crisis. The ban is likely to hurt Russians the most as they will pay more for food, and is expected to deepen the country's economic woes. Russia relies on imports for about a quarter of its milk, dairy products and fruit, and slightly less for its supplies of meat. The European Union also stand to lose because food and farming is its fourth biggest export industry. Some 10% of EU food exports -- worth €12 billion -- were delivered to Russia last year, making it Europe's second biggest customer. Fruit, cheese and pork are the EU's top food exports to Russia, making up about a quarter of the total. Apples and pears account for half the fruit exports. European officials say it's too soon to assess the impact yet, but Capital Economics reckons EU exports of the banned products are worth about $7 billion annually. Denmark described the measures as severe, and warned that world prices would fall as it, and other exporters, seek alternative markets for their products. Economists at Citi say the ban on imports could add as much as 1.9% to Russian inflation, already running at 7.5%. "It is unlikely that Russia will be able to speedily substitute for them with exports from other destinations," said Citi's Ivan Tchakarov. Capital Economics assesses the impact is likely to be less snevere, adding perhaps 0.5% to average prices. "Either way, the ban looks likely to make the central bank's fight against inflation even more difficult -- and raises the chances of additional interest rate hikes this year," it said. Interest rates in Russia have been raised three times already since March.